AQUA ILLUMINATION AI HYDRA 52 +HD FIFTY TWO BLACK CASE. With traditional LED lighting, there is a fixed total amount of power per color you can utilize to power your LEDs. With the Hydra HD Series from AI were unleashing your LEDs full potential by giving back control of the power to you. No longer are you limited to using a fixed amount of power per channel, the Hydra HD dynamically adjusts power available to each color, borrowing power from the colors youre not utilizing. Giving you the most vivid spectrum your tank has ever seen. Check out the PAR difference between a normal 20K color setting and one with HD enabled. The Hydra HD Series is capable of producing a limitless number of spectral combinations to fit your tanks exacting needs. Ai-Fi is the presence of built in WiFi in your AI devices allowing you to use the myAITM app on any iOS or Andrioid device to easily set up or program one or multiple AI Hydra HDs or Primes. Any WiFi enabled Mac or PC will work. Mounting AI lights is brilliantly simple. Hanging kits and tank mounts are available in black and white. Connect, mount, and hang single or multiple lights together with these versatile rails. Made from extruded aluminum in silver or black. Available in 6, 12 and 18 lengths. A sleek solution for mounting your AquaIllumination. Lights to your tank stand. Mounting bar and bracket to any flat surface. The EXT Hanging Kit allows you to hang one, or many, lights above your tank. With the included 96 inch cables, the EXT Hanging Kit easily adjusts to any height. Our versatile Classic Mounting Rails allow you to place the lights above your favorite corals by simply sliding the lights along the rails. The rails can easily be sized for your specific tank, and once placed you may move the modules as you wish about the tank. With new products come new questions. If you have additional questions or comments contact AI customer service. Do i need a controller to program the. Will the Hydra HD Series work with the. Will the Hydra HD Series work with the Director? A Director is not necessary to program a Hydra HD, however one or more HDs will operate alongside other AI LED modules that are being controlled by a Director. 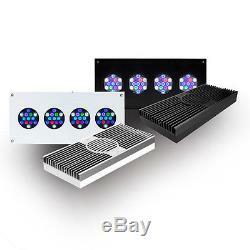 All AI LED fixtures including HDs will be identifiable and controllable using one myAITM account. Go to the App store or Google Play and search for myAI. Will the original Hydra TwentySix and Hydra FiftyTwo still be availble? No, the Hydra HD Series are replacing the original Hydra lights. Do the HDs need to be programed? No, however if un-programmed the HDs will remain on at full intensity while powered on. In this case you should operate the Hydra HD Series with a timer. Can you color match the new HDs with the original Hydra FiftyTwo and Hydra TwentySix? No, the colors and color proportions of the Hydra HD Series have changed. Are the Hydra HDs compatible with AIs mounting solutions? Yes, the HDs are compatible with the EXT and Classic mounting rails. 11.875 x 5.375 x 1.6. 7.28 x 5.375 x 1.6. 100 to 240VAC / 50-60Hz. ALL SALES ARE FINAL - NO RETURN ACCEPTED. We cannot mark the item as gift or less value. The item "AQUAILLUMINATION AI HYDRA 52 HD+ Fifty two AQUARIUM LED LIGHT BLACK CASE" is in sale since Saturday, November 04, 2017. This item is in the category "Computers/Tablets & Networking\Laptops & Netbooks\PC Laptops & Netbooks". The seller is "*aquashop*" and is located in Kansas City, Kansas. This item can be shipped to United States, Canada, United Kingdom, Denmark, Romania, Slovakia, Bulgaria, Czech republic, Finland, Hungary, Latvia, Lithuania, Malta, Estonia, Australia, Greece, Portugal, Cyprus, Slovenia, Japan, China, Sweden, South Korea, Indonesia, Taiwan, South africa, Thailand, Belgium, France, Hong Kong, Ireland, Netherlands, Poland, Spain, Italy, Germany, Austria, Russian federation, Israel, Mexico, New Zealand, Singapore, Switzerland, Norway, Ukraine, United arab emirates, Qatar, Kuwait, Bahrain, Croatia, Malaysia, Brazil, Colombia, Costa rica, Barbados, Bangladesh, Bermuda, Brunei darussalam, Bolivia, Ecuador, Egypt, French guiana, Guernsey, Gibraltar, Guadeloupe, Iceland, Jersey, Jordan, Cambodia, Cayman islands, Liechtenstein, Sri lanka, Luxembourg, Monaco, Macao, Martinique, Maldives, Nicaragua, Oman, Peru, Pakistan, Paraguay, Reunion.